Casablanca, Morocco: the entrance and interiors of the Morocco Mall luxurious shopping center, enriched with furnishings in Corian®. photos courtesy of Deborel Maroc, all rights reserved. Among the many architectural aspects that distinguish the mall, one of the first that captures the attention is the structure itself which incorporates the infinity "8" symbol and harmoniously compliments the Atlantic Ocean it faces. “The site looked very long at a first glance, so I imagined something where you could see the beginning but not the end. This gave me the idea to design a long curve facade, where the center of the curve is far out in the ocean, so when you walk along the building you can’t see where it ends,” explains Padoa. The design of the Morocco Mall creates a natural bridge between the building and the sea. It is a truly ground breaking design that is setting new standards in shopping center design. The undulated architecture is the stage and playful oasis for both tranquility and shopping. It is the first building in the world which encloses another building: within one side of this infinity loop, is the Galeries Lafayette store, one of the famous French brand's four stores world-wide. On the other loop is the VIP mall. Outside the Mall but accessible from the main entrance, there is another element highly visible and innovative element: an enormous IMAX® cinema designed by architect Yasser Kahlaoui. The building closes the infinity symbol and acts as a natural connection between the mall and the exterior landscape. The IMAX® 3D cinemas are well known for the innovative technologies used to offer the greatest brightness and clear sound, for a unique movie experience. The one located in the Morocco Mall has a capacity of 400 seats and offers the first digital projection in Africa. Within the building, a 550 square meter red shell-like form weighing 20 tons architecturally reflects the ties to nature and is made entirely in Corian®. The same techno-surface is also used for the bright red interior ceilings and some of the wall cladding. The natural solidity and ability of Corian® to take on any form or shape allowed Yasser Kahlaoui to create the illusion of an entire 3D structure. Each of the Corian® red panels have different sizes and inclination to create suggestive volumes. The panel cladding was conceived and installed by Deborel Maroc (under the guidance of Igor Desmazieres) in collaboration with technical specialists of Corian®. As highlighted by Yasser Kahlaoui, this interior 3D red shell in Corian® is unique in the world. The choice of red reflects enthusiasm and desire to dominate the scene, but at the same this color enhances human creativity and spreads energy. The IMAX® interiors are a kind of tasty red fruit to bite, or an underwater coral, something very attractive that you can’t avoid touching, an object of desire. 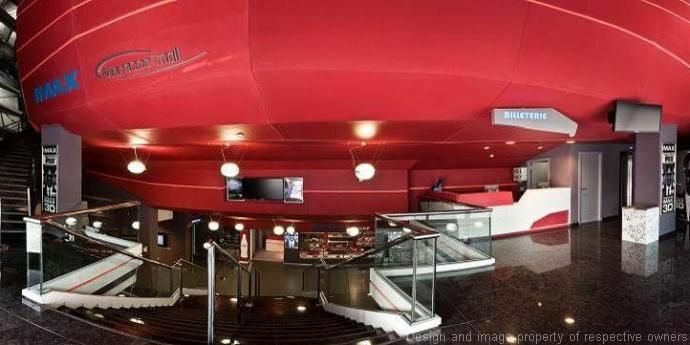 Corian® has also been selected for the IMAX® cinema sales counters. The shopping center could be considered the ultimate guide on the use of Corian® and its limitless applications. The techno-surface has been thermoformed, glued, carved, molded and inlayed. It has been used to create monolithic and seamless furniture. In fact, not only the IMAX® walls and counters but also many interior furnishings inside Morocco Mall public spaces and luxurious stores are in Corian®, among which: the entrance white reception desk decorated with a five-pointed Moroccan star pattern; all the black and white signaling totems, the TV panels that provide tactile information; the advertising screens, the “static directory” board located at every floor and bathroom design in the VIP area. 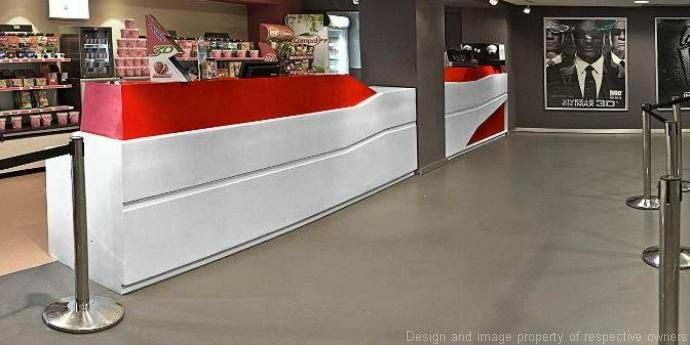 Furthermore, countertops on the second floor restaurants are in Corian® which has been chosen for this application both because it is easy to clean and for its hygienic properties and durability. A selection of the refined Corian® colour palette is expertly used to maximize visual effects: red for the IMAX® ceiling, an unusual brown for the advertising screens, black and white for the totems. The potential of Corian® is immeasurable, allowing architects to give free reign to their creativity. Interiors of the Morocco Mall in Casablanca, an elegant and luxurious shopping center, enriched with furnishings in Corian® like the advertising panels and digital signage totems; photos courtesy of Deborel Maroc, all rights reserved. Inside the VIP bathrooms located on the luxury floor, Corian® has been used to create beautiful moucharabieh style space dividers, in a white version for the ladies toilet, and in a black version for the men’s, giving a modern look to an object traditionally made of wood. All the furnishings made in Corian®, for both the mall interiors and the IMAX® cinema ceiling and walls, have been fabricated by Deborel Maroc. Deborel Maroc accepted the great challenge offered by the Moroccan Mall project, and showed in its realization the limitless design possibilities offered by this techno-surface, with the aim of contributing to its use in the growing Moroccan market.